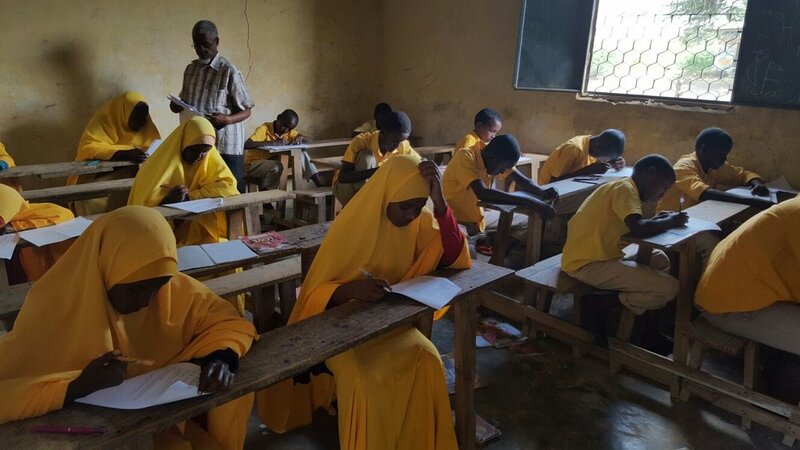 At our primary and high school, we are striving to ensure a brighter future for Somalia by providing our children with new skills, opportunities, and a fundamental understanding of human rights and their own political agency. We believe that providing a high-quality education is the key to pulling our students out of the cycle of violence and equipping our students to rebuild Somali society. We hope our schools can serve as models for the rest of the country. Both of our schools have a 1:1 ratio of boys and girls and are partly funded by small, annual contributions from families in the Village. The Waqaf-Dhiblawe Primary School offers free education for grades 1 – 7. Since the school opened its doors in 2010, the student population has grown exponentially to reach 800 students, demonstrating the strong demand in the community for education. Presently, we have 14 teachers providing lessons in Math, English, Science, Arabic, and Somali. In 2016, we opened the doors to our new high school, where around 200 students take co-ed courses in Mathematics, Chemistry, Biology, English, Arabic and Religious Studies. Many of our high school students also participate in an extracurricular soccer league. In 2017, we graduated our first class of students, many of whom are going on to university. In 2015, we commissioned the Orville H. Schell Jr. Center for International Human Rights at Yale Law School to design a four-year curriculum on human rights and conflict resolution for our high school students. Since then, a team of Yale students has been creating activities and lesson plans on a variety of human rights topics and issues. The curriculum has four modules: Identity & the Self, Conflict & Conflict Resolution, Human Rights Principles & Institutions, and Becoming a Changemaker. The activities challenge students to think critically about the meaning and application of human rights, the history and future of Somalia, and the intersections of human rights; the program encourages students to participate in civic communities in Hope Village and beyond. The Yale students are in constant contact with our teachers on the ground in Hope Village to revise and strengthen the curriculum. Dr. Deqo Mohamed with the first Yale students who worked on writing and designing the Human Rights & Conflict Resolution Curriculum. Our teachers need more training to facilitate our human rights curriculum and promote student-centered learning in their other classes. To meet this need, we are partnering with Solutions for Interrupted Education, Inc. to launch Aspire - a professional development program for teachers in Hope Village and in other post-conflict zones. In April 2018, we piloted the Aspire program in Clarkston, Georgia. We are planning to bring the program to our teachers in 2019.